Low-altitude, low-cost unmanned aerial vehicles are poised for a genuine breakthrough across a range of industries – and compact LiDAR sensors of unprecedented mobility will make that happen. So predicted Wayne Seto, Product Line Manager for industry leader Velodyne LiDAR, in remarks during a mid-October workshop in Washington, D.C., organized by the National Academies of Sciences, Engineering, and Medicine (http://www.nationalacademies.org/). Seto spoke before the National Academies’ Mapping Science Committee, a unit of the Board on Earth Sciences and Resources, on the ways in which high accuracy LiDAR will define next-generation UAVs and transform applications from mapping to robotics. 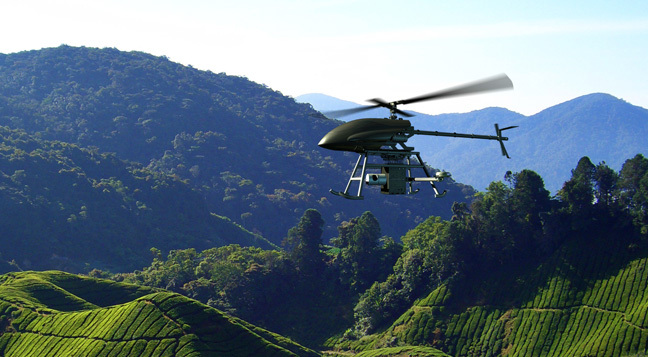 According to Seto, low-flying, data-rich LiDAR-equipped UAVs will be especially promising in agricultural and forestry applications. In the wake of new FAA regulations governing commercial UAV flights, legal ground rules are now in place to allow surveying and overflight of agricultural areas using pre-planned UAV routes. Seto addressed recent breakthroughs at NOAA, the National Oceanographic and Atmospheric Administration, combining sonar (under water) with LiDAR (above water). Since NOAA routinely measures waterways using multi-channel sonar, combining these multi-beam sonar sensors with Velodyne’s multi-beam LiDAR, above the water’s surface, was a natural next step. Citing the compact size and affordability of Velodyne’s 16-channel VLP-16 LiDAR Puck, Seto suggested that it was now feasible to expand NOAA’s capabilities – and those of other agencies -- to measure coastlines and water infrastructure in a single pass. Software from HyPack (http://www.hypack.com/) combines multi-beam sonar with multi-beam LiDAR using the GPS/IMU infrastructure that is already onboard NOAA’s research vessels. NASA Ames Lunar Rover. Consistent with the workshop’s focus on technology deployment by government agencies, the spotlight was on NASA Ames Lunar Rover. NASA uses Velodyne’s HDL-32E 360° LiDAR sensor for object detection and collision avoidance in uncharted territories, including simulated surfaces of the Moon and Mars. Robotic Perception: 3D Mapping. On this planet, discovering and charting unknown military targets and potentially hostile compounds represents an emerging area for LiDAR mapping. 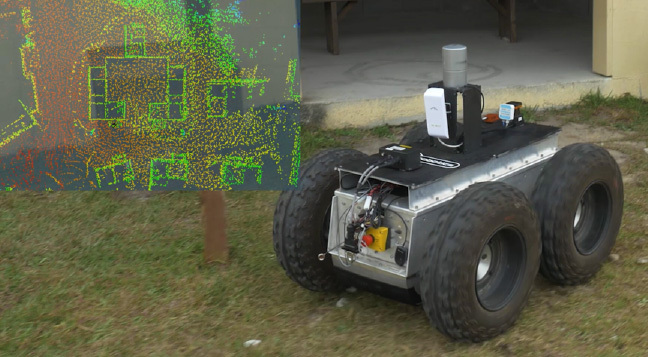 In a demonstration with a small earth-bound rover, 5D Robotics (http://5drobotics.com/) showed how Velodyne’s HDL-32E captures the layout of a compound from the inside, while keeping soldiers out of harm’s way. 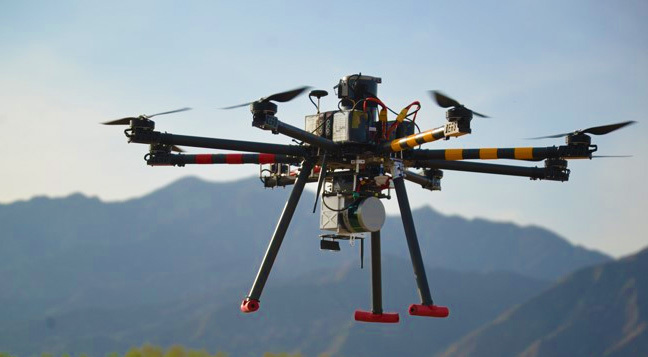 In parallel, the 5D Robotics application captures data from low-altitude UAVs, creating a combined 3D model of the compound —before military personnel need to enter the facility. Military Reconnaissance. 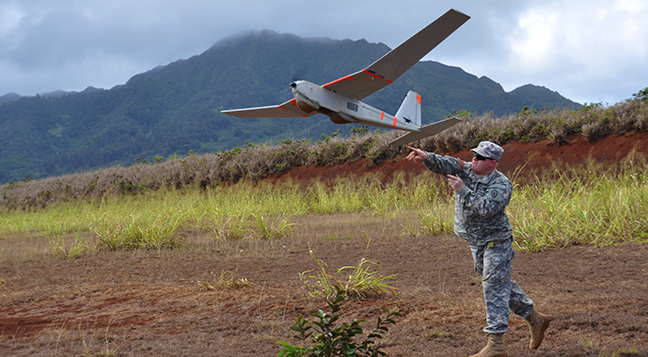 Aerovironment (https://www.avinc.com/) relies on LiDAR technology for reconnaissance in military operations. Velodyne’s Seto screened a video of Aerovironment’s PUMA fixed-wing low-altitude drone, equipped with Velodyne’s HDL-32E, capturing a remote military airfield. LiDAR data is especially appropriate for quantitative measurements, particularly determining dimensions of storage facilities and estimating volumes of stockpiled materials. The same Aerovironment technology monitors BP oil and gas pipelines in Alaska, for early detection and quantification of changes that could result in potentially devastating ruptures. Hundreds of miles of pipelines can be monitored remotely with AV’s PUMA – with no human involvement on the ground. UAV-Based LiDAR Mapping. Seto highlighted a number of applications dedicated to UAV-based forest and vegetation measurement. Phoenix Aerial (http://www.phoenix-aerial.com/) demonstrated several examples that underscored the superiority of LiDAR over photogrammetry. In one case, Seto showed that trees, bushes and other unstructured vertical vegetation could be captured only through LiDAR technology; a video from Phoenix Aerial, confirmed how Velodyne’s multiple returns were able to detect both a tree canopy and the riverbed underneath. In addition to enabling calculation of forest potential, the technology can also determine flood scenarios, were the river to ever spill over its banks. LiDAR: Penetration of Vegetation. At the workshop, True Reality GeoSpatial Solutions (http://www.liforest.com/), affiliated with UC Merced, focused on forest management market opportunities. In a video, the company showed an octocopter equipped with Velodyne’s lightest and most affordable LiDAR sensor, the 16-channel VLP-16 LiDAR Puck, capturing a forest and determining height, crown size and other relevant data points. The company’s forest management application extends to studies of grassland and wildlife population balance, where LiDAR-based vegetation measurements have significantly reduced the amount of work required of research teams – who formerly had to measure grasslands by hand. Seto, who recently joined Velodyne, brings to the company 15 years of experience in product marketing and product management. He previously worked at Intersil, Fairchild Semiconductor, Amalfi Semiconductor and WJ Communications, and has a background in LiDAR, laser headlights, displays, RF and power management supporting diverse markets such as automotive, industrial, wireless infrastructure equipment and consumer. Seto successfully grew product lines at his previous companies, moving from startup mode to major revenue contributor. His expertise encompasses both inbound and outbound marketing to commercial and enterprise customers, working directly with them to define next-generation products. Founded in 1983 and based in California’s Silicon Valley, Velodyne Acoustics, Inc. is a diversified technology company known worldwide for its high-performance audio equipment and real-time LiDAR sensors. The company’s LiDAR division evolved after founder/inventor David Hall competed in the 2004-05 DARPA Grand Challenge using stereovision technology. Based on his experience during this challenge, Hall recognized the limitations of stereovision and developed the HDL-64 high-resolution LiDAR sensor. Velodyne subsequently released its compact, lightweight HDL 32E sensor, available for many applications including UAVs, and the new VLP-16 LiDAR Puck, a 16-channel real-time LiDAR sensor that is both substantially smaller and dramatically less expensive than previous generation sensors. Market research firm Frost & Sullivan has honored the company and the VLP-16 with its 2015 North American Automotive ADAS (Advanced Driver Assistance System) Sensors Product Leadership Award. Since 2007, Velodyne’s LiDAR division has emerged as the leading developer, manufacturer and supplier of real-time LiDAR sensor technology used in a variety of commercial applications including autonomous vehicles, vehicle safety systems, 3D mobile mapping, 3D aerial mapping and security. For more information, visit http://www.velodynelidar.com/. For the latest information on new products and to receive Velodyne’s newsletter, register here.